Mae Baham is in the Intensive Care Unit at UCLA Medical Center after saving her granddaughter from a hit-and-run driver on Wednesday, Nov. 25, 2015. INGLEWOOD, CA -- An 8-year-old girl is pleading for help after she escaped serious injury when her grandmother saved her from a hit-and-run driver. 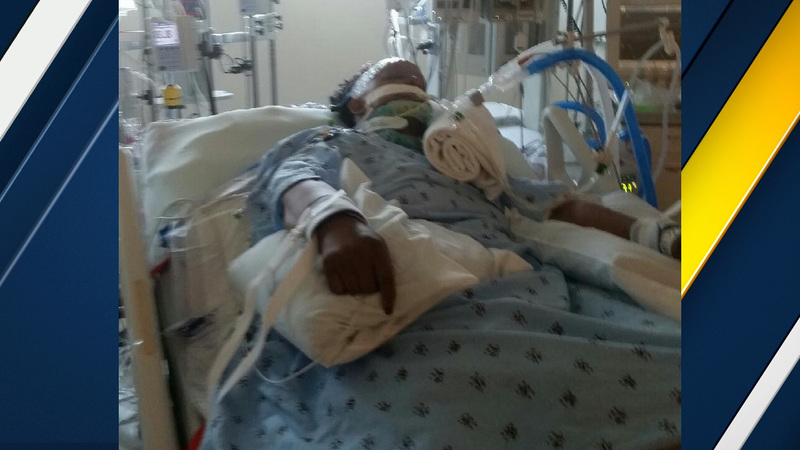 Emonie Baham fractured her leg when she was hit at La Brea Avenue and Queen Street in Inglewood at about 5:30 a.m. on Wednesday. Her grandmother, 55-year-old Mae Baham, is in a coma fighting for her life at UCLA Medical Center. "We just got hit and she pushed me out of the way so I wouldn't get hit. She took the chance so she could get hit. I flew over the car and my leg started hurting," Emonie said. Police said Baham and her granddaughter were out for a walk when they were walking in the crosswalk and the suspect ran a red light. Baham pushed her granddaughter out of the way, taking the brunt of the impact. According to witnesses, the driver initially pulled over, but then drove off. "It's one thing if you hit an adult, but you hit a child too. Not one person, but two people and did not stop. What kind of heart do you have? That's not right and it's not fair," Emonie's mother Wykishia Smith said. Investigators said the vehicle is described as a dark green or black Nissan Altima. The vehicle likely has significant front end damage and possibly a shattered windshield, police said. Officials are reviewing surveillance videos from cameras in the area. If you have any information that can help police in their investigation, you are urged to call the Inglewood Police Anonymous Hotline at (888) 412-7463.